Dalyan is a town in southern Muğla Province of Turkey. 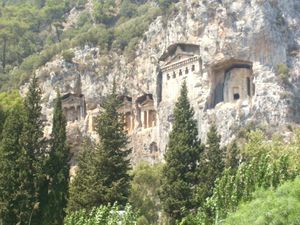 Dalyan is established in an environmentally protected area. This is one of the few surviving places of paradise, an area of natural beauty and historical interest. A ferry boat trip can be booked from Marmaris which will take you to just outside of Dalyan, Will then need to transfer onto small ferry boats to continue onwards into the estuary river into the fresh water. A regular dolmuş service that runs to neighbouring resorts such as Fethiye and Marmaris as well as surrounding villages. Flights are daily from most UK Airports between April and October to Dalaman Airport. Dalyan is then a 40 minute taxi ride away. The ancient city of Caunos lies here with its ruins dating back to the 3rd Century. The Dalyan channel through which water circulates between the Mediterranean and Koycegiz Lake winds its way down past the ancient Rock Tombs to the sea, via a small network of lakes and waterways. Through the rustling reed beds rising between 3 and 5 metres in height. With its mixture of fresh and salt water, these wetlands are now home to a vast number of fish and other water life, as well as the birds of many species which feed on them, species such as the Sparrow hawk, Crane, Kingfisher and Jay. The Stork is also native to this area migrating here at the end of March to nest until the end of August. Dividing the delta is the Iztuzu sandbar stretching for 5 km east from the south of the channel. With fine crystal sand, shallow turquoise sea Iztuzu beach is the ideal seaside spot. Which can be reached by regular dolmus or boat service from Dalyan. This is also the beach where the endangered Loggerhead Turtle (Caretta caretta) and the green turtle (Chelonia mydas) have returned to lay their eggs since the beginning of time. The nesting time being from May till October. Visit the mud baths which has a warm sulphur pool. A good outdoor spa. There are many restaurants in which to try local Turkish cuisine, music bars and shops. Lamb meat is a famous Turkish food and also another one is Kebap. A traditional spirit called raki which is a classic Turkish beverage made from grapes and aniseed that has been distilled for centuries. There are a couple of discos on the outskirts of the village so as not to disturb those of you that wish to retire early. Hotel Portakal Beautiful location at the end of the village on the Dalaman river. It's only a 10 minute walk into the village center. This page was last edited on 27 November 2017, at 23:01.